SSC GD Recruitment 2019:- As Per the Official Staff Selection Commission’s Website, SSC GD Recruitment Notification for Filling upto 57000 Posts Released Now. Also, as per the GD Constable Notification, Online Application Form Started from July 2019. There, You can Apply Online for the Constable GD Posts. Also, Below You can download the Recently Released SSC General Duty Official Notice i.e. Uploaded on @ ssc.nic.in Official Portal. There are huge numbers of Government recruitments are available in our country. Also, the Staff Selection Commission is the largest recruitment board in India, i.e. Releasing Maximum Vacancy Number to fill the Government Posts. Since the beginning of the SSC GD Recruitment process 2019. All aspirants should also go to the official portal of the staff commission i.e. Online filling process of the SSC GD application form. All candidates must read the eligibility criteria from the notification uploaded below before applying online for the SSC GD Constable. As Per the Official Notification is now uploaded on the official portal i.e. ssc.nic.in. All applicants can now download the Official GD Recruitment Notification in the SSC GD Constable Recruitment 2019 Official as well as read out the complete notification to know the eligibility criteria. You can then go to the Online Form Application Process and complete the complete form. So, too. Keep the scanned copy of all your educational certificates. So you can apply online on the official ssconline.nic.in the portal for the SSC GD Online Form 2019. The SSC has different jobs in it. The Exam Board of the SSC will provide the SSC GD 2019 notification for jobs every now and then. 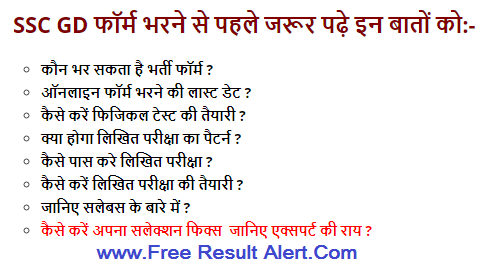 SSC GD Recruitment 2019 & Exam Date से संबंधित किसी भी प्रकार की समस्या हो तो आप नीचे दिए गए कमेंट बॉक्स के माध्यम से पूछ सकते हो हमारी टीम आपकी पूरी सहायता करेगी! SSC GD Educational Qualification: Minimum 10th Class/Matriculation pass required for SSC GD recruitment 2019. Age Limit: Minimum age limit is 18 years & Maximum Age limit is 23 years old. Salary in SSC GD Bharti 2019: In SSC GD Constable vacancy 2018, you can get a gross salary of Rs 20,200/- with Rs.2000/- Grade Pay. Application Fee: Application fee for SSC GD General & OBC candidates Rs. 50/-.No fee for SC, ST, PWD & Female candidates. To apply for this post, they can either choose the online or offline mode after reading the SSC GD constable selection process at Website sscgd.co.in It is possible in both ways. And the exam board will also announce the SSC GD Online 2019 selection process to register for this post. After viewing the 2019 SSC GD Bharti, candidates will be able to view this post’s eligibility details. The candidates may conclude whether or not to apply for this post online on the official ssconline.nic.in website. If they are satisfied with the eligibility details, they can go to the SSC GD 2019 application form process. SSC Constable GD 2019 Expected Cutoff Marks: The cutoff marks required for this sscgd Exam is given below for each category. In SSC GD Cut off marks 2019, all required details are given below like- Physical, Medical & Written exam. They will issue the 2019 SSC admit card on the website of the department. Otherwise, through online sites, they can get them. The results & final merit list of the SSC GD Application Form 2019 should be published on the official website. They also have to pay without fail the registration fees. And the candidate should apply without fail to the post on or before the last date. Otherwise, the request will be rejected. Thanks for reading this article. The further details of SSC GD recruitment 2019 notification, exam date, admit card, result will be updated soon on our website regarding this post. Sir me ST se hi SSC gedi ke lia kitbag hit magta h mera 10th me 288 mark’s h sir jaldi bataiy. Me konrad book padu. Sir kya isme phle physical hoga kyaaa sir meri highet 167 cm aur hame ummid h ki me October tk 170 cm kr lunga kya me aavedan kr sacta hu plz reply me my whatsapp no.7726961764. please reduce the hight to 165 cm. Sir. Ji. Meri. Hight. 168c. Hai. Kya. Me. Form. Bhar. Sakata hun? Sir m Gen hu Meri d.o.v 01/05/1995 hai m form bar skta hu. Namaskar sir, Mera date of birth 17th may 1994 Hai, Mai general cast se hu, Kya Mai iske liye eligible hu? Sir mera d, o, b 27/03/1993 hey +obc hey mey from var saktahu kiya please sir reply. vk …………kya modi ji k raaj me ssc gd ki bharti aaygi k nahi. Sir mai sc se hu mera date of birth 12.08.1990 hai kya mai apply kar sakta hu reply sir urgent…..
sir age ka calculation kb se hoga 1/8/2017 se ya 1/8/2018 se. Sir, please said the date of advertisement of ssc gd conistable. SSC GD ka vacancy kab aa rha hai. Hello sir/main premeswar rabha bol rahe hu.sir ssc GD kab ayega.osemain intejar main hu ,pleas juldi online main soru kar digiyein. thanks…….’Gai Hind Bharat…………………………………. Tujhe kisne bataya….dilasa de raha hai kya…mazak ka samay nhi hai…jo v bol raha hai shi bolo….jai hind. Those candidates who are waiting for the result must know the important fact about the SSC GD Vacancy. Candidates who are willing to work under the police can apply for this exam. In 2017 there are almost 57,000 vacancies released for this post. Modi ji ke jane ke bad good day aayega. 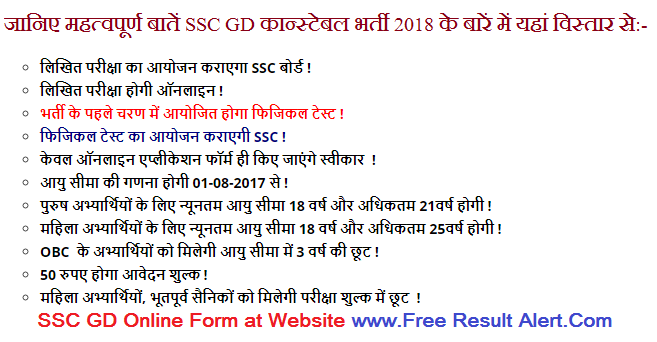 ssc gd bharti aa gayi hai 20/03/2018 ko notification update Ho jayega. Bai tune kha dekha h???? faltu logo ko gumrah kyu kr rahe ho.aap koi ssc ka chief baat kr rahe kya. 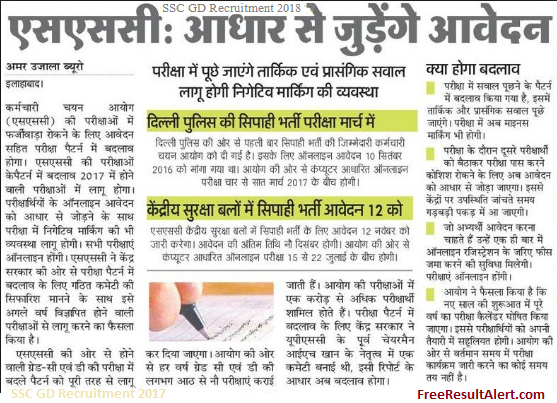 Candidates will have to follow all the points which have described here for filling SSC Constable GD application form for upcoming SSC GD Constable Recruitment 2018. Thik bol rhe hai. Ab to yhi lag rha hai. Kab online hoga SSC gd sir batiea na please. Besabri se intejar kar rhe hai. sir SSC gd consateble recruitment kab aa rhi h ?Please sir hum waiting kar rahe h .
Bhai isme politics mat lavo.